Be the business mogul you've always wanted to be with these all-time classic 'Tycoon' games! There really have been an awful lot of ‘Tycoon’ style games released over the years. This was especially the case during the 90s and early 2000s which saw new business simulation games dropped into the market every other week. Many were simply mediocre cash-ins. However, a few have stood the test of time as the best tycoon games ever made. These classics certainly know how to tap into our capitalistic desires to dominate the world with our parks, hospitals, railroads, and what-have-yous. Here are 10 of our yesteryear favorites! 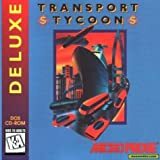 This list only focuses on the best tycoon games from the 90s and early 2000s. We’ll release another list of modern business simulation games soon that’ll include newer titles like Planet Coaster and Parkitect. Micro-management is key to success. You’ll handle dozens of different tasks at once, each one affecting others. Lots of curveballs. Escaping animals and train accidents are just some of the unexpected challenges you’ll face. These best tycoon games will keep you on your toes, punishing complacency and rewarding vigilance. No traditional city-builders. You’ll notice we’ve left out games like SimCity here. That’s because we’ve already put together 10 City-Building Games for you to check out! For this list, we’ve stuck to more businessy / managerial tycoon games. All images / videos are copyrighted to their respective owners. This post contains Amazon affiliate links. We earn a small commission if you buy anything through them, at no extra cost to you. Technically, this tycoon series is still ongoing, what with the recent release of RollerCoaster Tycoon Worlds. However, this installment was severely panned by critics and fans alike. Thankfully, the original two RollerCoaster Tycoons are still among the best tycoon games ever released – the third being somewhat hit and miss. Much like Theme Park, these tycoon games task you with building and managing huge amusement parks. Roller coasters are a special focus (duh). You’re basically in charge of everything from constructing rides, hiring and firing staff members, and making sure money is well-spent on keeping things running. You’ll also construct various entertainment shops and food / drink stalls to keep your guests happy and full. However, you’ll have to watch out for impending disasters – some of the funniest ones being intentional. Business simulation games like RollerCoaster Tycoon make killing (cartoon) people a blast! RollerCoaster Tycoon 2 and 3 improve upon the base construction system of the original. In these titles, you’re given even greater freedom to individually place each ride, wall, roof, or scenic tile as you please, thus allowing you to flex your creativity. Official add-ons also introduce a ton of content, including more water rides, elaborate coaster designs, and micro-management systems – making these best tycoon games even better. Fans tend to praise RCT2 as the ultimate installment of the series. 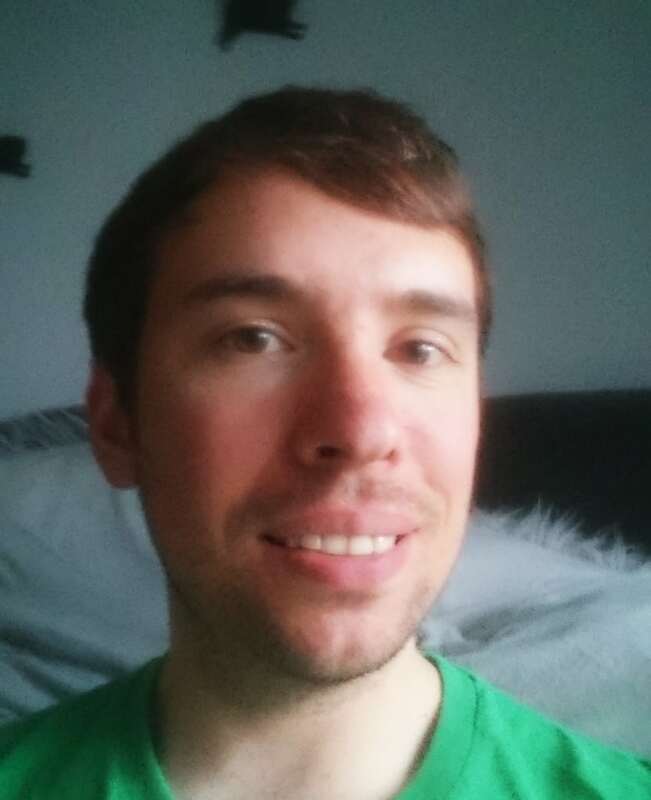 Read more honest player reviews of the RollerCoaster Tycoon series. 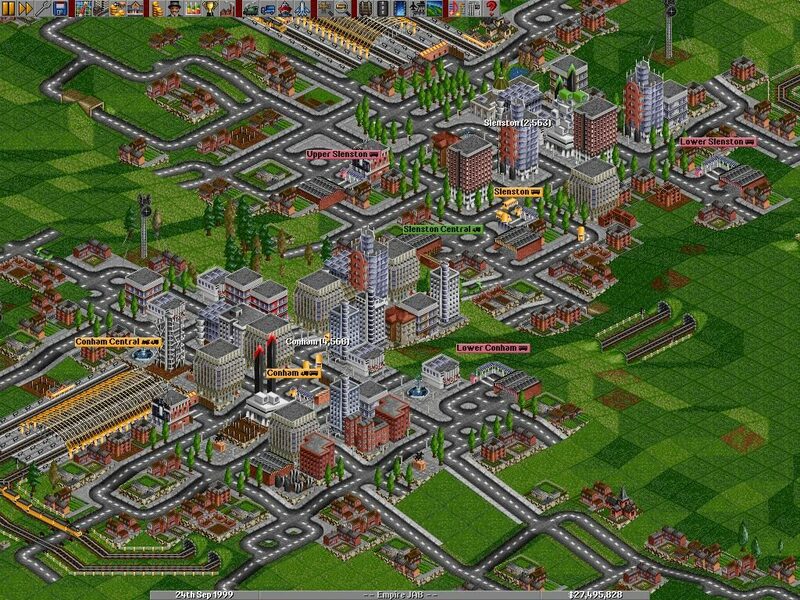 Made by the same genius behind RollerCoaster Tycoon, Transport Tycoon is easily one of the best tycoon games ever created. The basic premise is in the title. Starting out with a small sum of money, your goal is to construct routes and stations near various towns and industrial areas. You’ll then have to find ways to profit from these transport systems, paying off your initial loan as you expand into more advanced and efficient technologies. A huge chunk of revenue comes from successfully transporting a commuter from one area to another where he / she is in high demand. Typical to most business simulation games, rival companies will also be vying for dominance, looking to eat into your profit share. You’ll thus have to constantly invest in new research to stay ahead of your competition, making sure to purchase improved trains to better transport your travellers. However, random disasters such as train or even Zeppelin accidents may hinder your progress. In addition to the official Transport Tycoon, you’ll be happy to know there’s also a fan-made version available (OpenTTD). This game mimics a lot of the features in the original release but offers its own free add-ons. Read more honest player reviews of Transport Tycoon. Here’s a bit of random info. As a kid growing up, I used to laugh at the intro cutscene for Theme Hospital. It boils down to a living patient on an operating table whose credit card has just been declined. He’s then immediately jettisoned straight to the morgue, still alive. Back then, I thought it was so funny. Then I grew up and learnt about how the American Healthcare system really works. That’s when this business simulation game became more satire than slapstick. As for the gameplay itself, you’re essentially tasked with running a privately-owned hospital filled with ill patients in need of immediate medical care. The game is filled with a lot of morbid tongue-and-cheek humor as you struggle to cure them of odd diseases such as King Complex (a homage to Elvis) and Alien DNA. You’ll also spend most of your time building rooms, hiring doctors and other employees, and investing in medical diagnosis and research. In addition, you’ll be tasked with furnishing your hospital rooms with vending machines and other decors to keep waiting patients happy. Rat infestations and various potential disasters keep you from getting too settled in. Theme Hospital easily makes our list of best tycoon games, thanks largely to its enduring charm and still-fun gameplay mechanics. Read more honest player reviews of Theme Hospital. 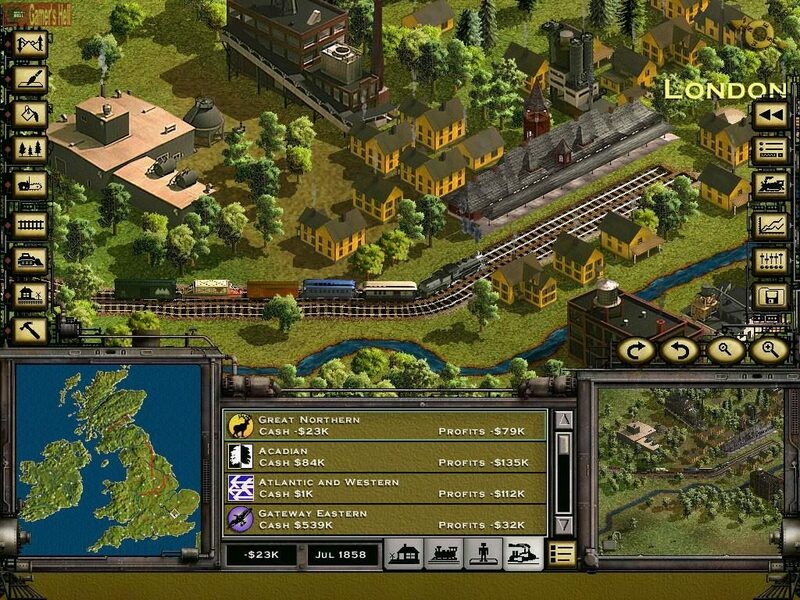 At first, the Railroad Tycoon series seems similar to Transport Tycoon. However, this game is purely focused on trains alone and is much more business-oriented. Your main objective is to manage your own railroad company. This includes planning and laying down tracks, along with constructing new stations. You’ll also have to price your tickets correctly to keep commuters coming, making sure to set up comprehensive timetables. In addition, you’ll need to keep a watch over your share prices while purchasing bonds and getting loans from the bank. There’s also the capitalistic option of buying out your competition to expand your railroad empire – although you’ll want to manage your finances properly to avoid bankruptcy. Different scenario maps include various challenges, usually in the form of historically-inspired situations that you’ll need to overcome with some business savvy. You may also want to try the latest (unofficial) entry in the series, released under Fraxis as Sid Meier’s Railroads! Overall, the Railroad Tycoon franchise remains as addictive as ever, cementing its place among other best tycoon games. Read more honest player reviews of the Railroad Tycoon series. Sure, we’ve already mentioned RollerCoaster Tycoon. However, there’s no way we weren’t gonna put the classic Theme Park series on our list of best tycoon games. Yet, while the two franchises do share many similarities, these business simulation games also vary quite a bit in tone, aesthetics, and accessibility. For starters, most tycoon enthusiasts consider RollerCoaster Tycoon to be the superior franchise overall. However, Theme Park has received well-deserved praise for having an exceptional presentation style with lots of bright colors and a distinct cartoony look. 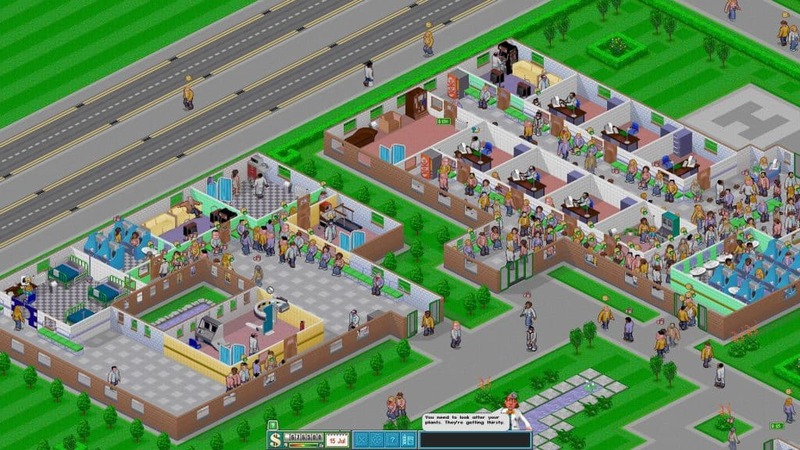 In addition, the games have a quirky sense of humor similar to Theme Hospital that’ll appeal to many. With pre-created rides,Theme Park places less emphasis on customizing great attractions. Instead, the focus is on managing and designing your park on the whole (RTC does the same, but with more ‘do it yourself’ ride options). 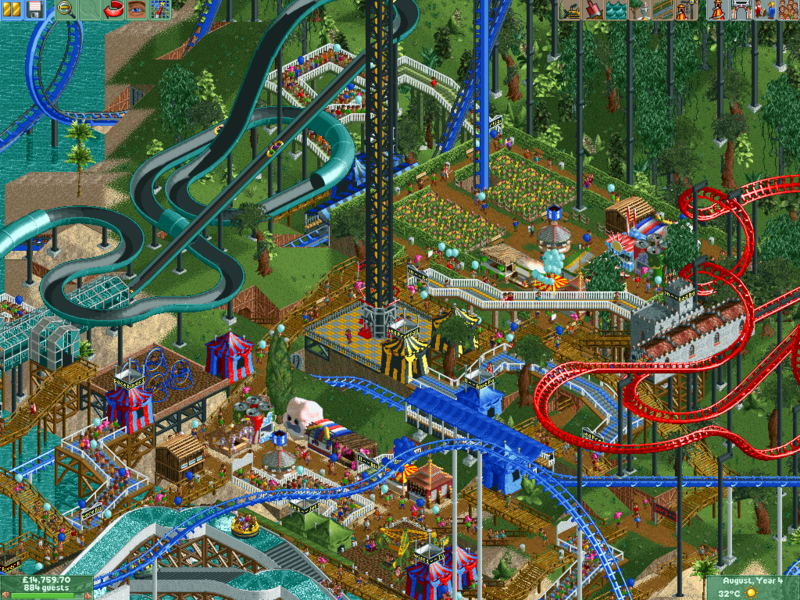 In short, Theme Park is far more accessible, though RollerCoaster Tycoon offers you much more sandbox depth. Like other best tycoon games, Theme Park tasks you with handling your own funds and profits. You’ll build rides, entertainment acts, walkways, shops, toilets, and many more facilities. Hiring the right staff members for each job is also crucial, since they’re responsible for keeping the place tidy and operational. You’ll also have to charge the appropriate amount for your tickets to attract customers. Too high and nobody will come; too low and your profit margins start to suffer. Disaster can also strike at any time, usually in the form of vomit splattered on the walkways. Yikes! 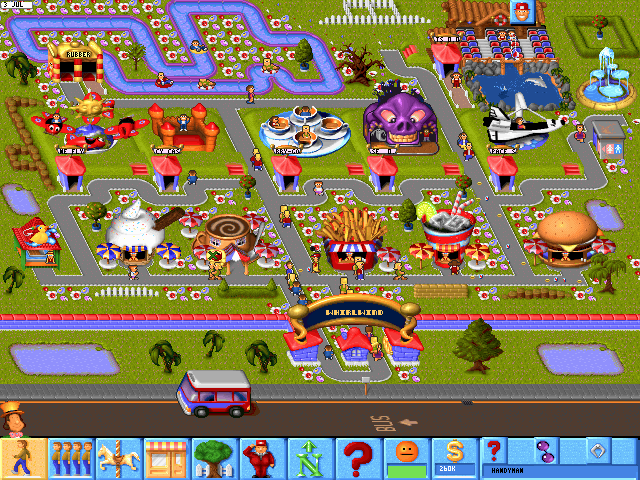 Overall, Theme Park is often overshadowed by the RollerCoaster Tycoon series. However, the franchise still has some of the best tycoon games ever made. Well-worth playing! Read more honest player reviews of the Theme Park series.